Music critics are comparing Wilco's Being There to the Rolling Stones' Exile on Main Street, but Sticky Fingers makes a great comparison piece as well. Most of the Stones' influence is provided by the Nicky Hopkins-style piano playing of Jay Bennett, particularly on the opening Misunderstood, yet there's so much more to this group and this album that seems to always be left out. On Far, Far Away the band transforms the Rolling Stones' influence into that of Neil Young. I Got You (at the End of the Century) borrows from the Eagles' Already Gone, and Red-Eyed and Blue conjures up Running on Empty — Jackson Browne's road-weary album. Sunken Treasure is a hodge-podge of Cream, The Beatles, Traffic, and the Rolling Stones. There are even influences from Johnny Cash (Somebody Else's Song), The Band (Kingpin), and Rod Stewart (Dreamer in My Dreams). Wilco masterfully draws from a wide range of influences in order to create something fresh and new, and its songs pay tribute to its inspirations. In addition, the group's live performances often include drastically revamped versions of its material. 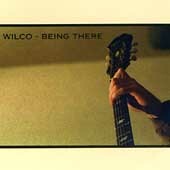 Wilco is definitely an outfit on the rise, and Being There is the sound of it coming into its own. Being There is available from Barnes & Noble.